The I-405 is one of Los Angeles biggest and busiest freeways and just a few years ago underwent a US$1 billion widening project. But as the saying goes, what you feed grows and a few days ago that was highlighted in nightmarish fashion as tens of thousands tried to get away for Thanksgiving. The images come from ABC7 Eyewitness News twitter feed. All modes can have issues from time to time but unless we can focus on developing some serious multi-modal options then perhaps this will be a vision of Auckland’s future. That is just an example of ‘foot voting’ There is already a long distance rail network and a very good passenger aviation network but these people all feel they are better off taking their car. Not for the first time you are completely wrong Patrick. They built a freeway. It is free to use (other than your time and fuel). There is no need to book a time to travel so when there is a family holiday lots of people all show up at once. They could have booked a seat on a Greyhound bus but they decided not to. Not building the freeway in the first place would not have made anyone in that picture better off. There would just be more people queuing on other roads instead and worse, many people would have decided they couldn’t travel at all so would have missed out on the utility they get from visiting family. Economists call that a wealth effect. You might think a metro system might have helped, but given most of the extra trips from one house to another house over a long distance then it is hard to see who would have used that instead. Funny you assume they are all fat, angry, ailing and ill-tempered yet you think others are the misanthropes. LA has poor but improving rapid transit within the metro area. Many of these people will be regular commuters who would certainly benefit from alternative options. You are right that it is a free choice, but the choices aren’t great for one of the wealthiest cities in the world. ‘ They built a freeway. It is free to use (other than your time and fuel).’ – the US military industrial complex led market demand by building freeways and buying and ripping out the tram network in the 1940s and 50s. The citizens of LA were happy with their tram network. ‘There is no need to book a time to travel so when there is a family holiday lots of people all show up at once.’ – you have to be kidding me. I would absolutely be timing travel to avoid that nightmare. That is by no definition freedom. ‘ many people would have decided they couldn’t travel at all so would have missed out on the utility they get from visiting family. Economists call that a wealth effect.’ – WTF. growing stuff, creating and selling ideas, products, services is a wealth effect. How can sitting in a traffic jam for hours be remotely productive? ‘There is already a long distance rail network and a very good passenger aviation network but these people all feel they are better off taking their car.’ – the airline industry is creaking at the seams while long distance intercity rail in the US? Yeah Nah. What about not building the freeway and instead investing in the rail network so that it’s actually viable for passenger journeys over moderate distances and doesn’t stop unannounced for 3 hours in the middle of nowhere to let a freight train by? What about not building the freeway and instead investing in metro networks to take people to local-ish destinations? What about investing in public transport so that people can get to LAX more easily to fly to long-distance destinations? What about building a smaller, more affordable freeway and sending some kind of signal, perhaps through the medium of currency, that having everyone leaving at the same time is suboptimal, and that those who can choose to leave at different times should do so? What about providing other options for regular commuters to free up space for anyone who really doesn’t have a choice other than to drive to Grandma’s house? Seriously, ‘foot voting’ only gives useful information when the provision of options is not so staggeringly disproportionate. If I were offered a small, mouldy strawberry, an unripe banana and a fresh bag of perfect oranges, I’d take an orange, but that doesn’t tell you anything about what fruit I like best. Also, humans are rather poor at making completely rational decisions. Even when we have good alternatives, people still choose to drive and cause / sit in traffic for lots of dumb reasons. It’s what they’ve always done. They paid lots of money for their car so they’re damn well going to use it (sunk cost fallacy). Prejudice – only poor people get the bus (clearly totally irrational). They haven’t been bothered to check out other options. Decades of car advertising drivel has wormed its way into their heads and they believe that the massive lump of metal costing them $1000s of dollars each year, trapping them in traffic, destroying the environment and putting lives at risk, is somehow an embodiment of freedom. Good theory Nick. People are hopeless at making their own choices. So what we really need is a sensible person to make all our choices for us. Perhaps yourself Nick. And if we don’t do as you say maybe a police force or army to enforce your will. You could put up statues of yourself to remind us all of your wisdom and benevolence. I am sure it would all end well. Nick people often make irrational individual decisions but at scale people tend towards the rational in their choices. Transport selection is not immune to this. The point that mfwic wilfully refuses to understand that in the case above there is no viable alternative because of his closed commitment to seeing the world as a function of perfect ‘revealed choice’ rather than what it actually is; the forced choice of the provided infrastructure. Which is to say given real options people will take them, there is no god that says everyone will always drive no matter how suboptimal the experience, nor how attractive other options, except the god of transport planning and funding that offers no real alternative. In other news LAX experienced one of its busiest days the same day the photos above were taken. Travellers were advised to arrive 2 hours before boarding (not 2 hours before departure). Transport critic Patrick Reynolds was quoted as saying “I told them there was no point building more terminal capacity, it has just resulted in more people travelling”. I vote for Nick over mfwic! But really, the typical strawman stuff about PT being “imposed on people”. The blog post essentially shows that even if you spend billions on a roading system, it will still be congested at peak times. So why not invest into modes that are less damaging to our world, and our health? Nobody is forcing an individual to *use* a specific mode, and it is a fair call that all modes should be provided for – but as communities with a finite amount of space and money, we – voters, politicians, forum disputants – have a right to decide which modes we favour more and spend more on. That’s the very opposite of imposing things by the “elites” as Trump and Co say in their propaganda. In fact, if vested interests hadnt pushed for more and more roading works throughout the last 50 years, and had listened to democracy and public discussion more, we’d not be in the space we are, I’d say. But its so easy to just claim that it was all a natural outcome. Funny, that would make it a “natural” outcome that may still end up killing our planet’s ecosystems. Screw that kind of logic and normalisation. Making up quotes really is getting a little bitter, John, even for you. And it is dull to be misrepresented, even by such a self-described wit. I never say ‘don’t build things’ but rather be aware that what you build will shape the pattern of behaviour. That’s all. More like a vision of the present situation. The Silverdale – Puhoi motorway may not have 12 lanes, but it looks exactly like that in a long weekend. – you’re limited to only a few times of the day you can leave. – from a lot of places, you’ll be on local buses for a long time before reaching the intercity bus stop. Or it’s not possible to get to the bus stop without a car at all. So where can you park your car for an entire weekend? Sunday timetables, remember. – where the bus drops you off, it’s often almost impossible to get around without a car anyway. A few hours of delay in those queues will be inconsequential compared to the inconvenience and the time you lose by taking the bus, and having to get around without a car at your destination. Driving is the rational choice for a lot of people in that queue. 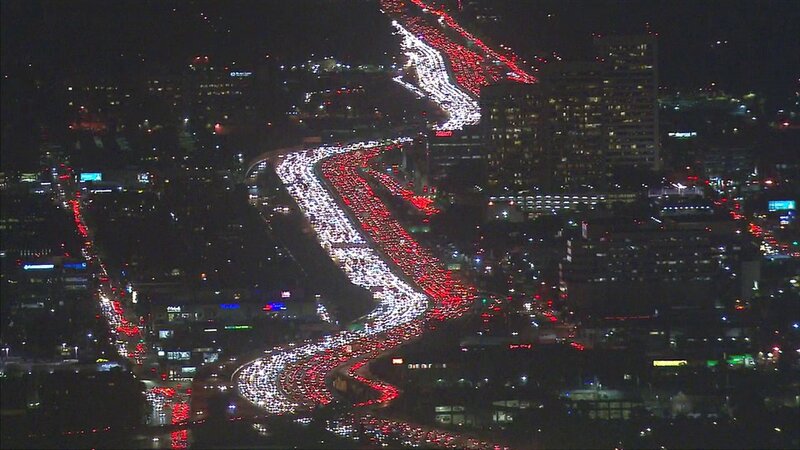 That freeway is full of normal commuters who could’ve taken the train or bus if the LA public transport system was anything to write home about. That would’ve freed up the holiday traffic for a better ride on either this arterial or others. The article you linked on how faster journey times will influence mode choice is interesting, Patrick, and points to the further increased patronage we could see for rail in Auckland if AT could sort out their journey times. The lowest hanging fruit that has been discussed many times on this blog is dwell times. Likely to be big gains for AT in sorting this out, if they have courage. Looks like they need an alternative holiday highway for a couple billion. Surely Trump will pay for that from his taxes. They should have a rule that everyone in December must change their front headlights green. Then that way they can claim the roading system was designed like that for a reason. I am in the UK at the moment, Had the trip all planned out, using cheap, advance-purchased but inflexible rail fares. However an unexpected family situation forced a change-of-plan, including deferring a long-distance rail-journey. This resulted in forfeiture of the cheap advance-purchased tickets. But re-booking at short notice means fares of perhaps 4 times the advance-purchase. And even if a cheaper alternative can be found by time-consuming sleuthing over an alternative route, one missed connection due to a delayed service can mean loss of the rest of a cheap-but-inflexible travel plan. “Yield-marketing” one might opine, but the system makes a more-complex journey so fraught and potentially penal, that it turns out far cheaper and easier to take a rental car, This is not a free choice. It is disuasion through deterrent-pricing. The very effect which should be applied to road-usage to curtail it for the planet’s sake is being applied to rail which should be incentivised. The anglophone world still has its transport philosophy arse-about-face. This post makes me laugh. It’s like a scare tactic to try and convince people we should be investing in <1 BCR PT projects. No PT system is eliminate Thanksgiving Day congestion, just like it wont eliminate Long Weekend congestion in Auckland. That's because you've got hundreds of thousands of people going to hundred's of thousands of different places. Funny, cause when I lived in the UK I could jump on a train during busy holidays and get from A-B easily, even though there were hundreds of thousands of people going to hundred’s of thousands of different places. So we should build a hideously over designed motorway to cater for holiday traffic that occurs， at most， 4 times a year? Funny how in Switzerland you can hop on a train and go to thousands of different places, or if you so desire you can also sit in traffic in the Gotthard Tunnel if you so desire. Fact is whilst motorways will always be congested to a standstill fairly frequently, it’s the complete lack of alternatives in Auckland and NZ that makes the situation so bad. Well put Patrick. This is the result of a failure to plan for the future and fully understand and address the problem. There is a simple and obvious solution but to talk about transport beyond the car no one wants to know. To fail to plan is a plan to fail. We havent had government planning since 1980s. Except in the future they won’t need brake lights as all the cars will be self driving. It will look the same but less pretty. I have been to LA a dozen or more times as a tourist, but long ago decided I just didn’t like this over-automobiled, over motorwayed city. Having experienced the main attractions, I found from a tourist perspective, it was just not a destination I enjoyed. And even some of the freeways were in very poor repair. Apart from a transit stop I don’t intend to visit again because there are so many other rewarding places to visit where you don’t come a distant second to the ubiquitous motor-car. Contrast LA with cities like Vienna where I understand many people think, why would I take the car?, because the public transport network goes everywhere and it is so damned cheap. I wonder if 2017 will be the year that AT provide public transport to the Kumeu Car Show, which attracts 40,000 people? Yeah hopefully, because the new network doesn’t even kick in by March when its hosted. So that means a continuation of crappy Saturday buses and no Sunday buses this year. Even so though, there should be some event services, ideally from Swanson. A vision of Auckland’s future? I’d say this is Auckland’s today, the present state of what we have. Traffic jams and no alternatives but to sit in traffic, and absolutely no political will from Government or Auckland Transport to do anything different going forward. People advocating that taking a bus would be a better alternative seem to miss the point. There’s no special bus lanes on that motorway. A viable alternative needs a viable alternative route. Trains or metro following a completely separate system would seem to be the only answer. Sharing the road with the stationary car traffic is not an alternative means of transport, just an alternative means of torture. Yes! Unfortunately this government’s consistent thinking seems to be ‘if they want PT just shove them on buses’. I guess if they want to spend their time sitting on a giant free/motorway, that’s their choice. Please don’t continue to spend billions on widening our motorways so they look like this. Spend it on alternative modes, which are being used, if you turn your head from your vehicle to see the large numbers of passengers on the trains and northern express buses rushing past. I really wish I wouldn’t see images of Gerry Brownlee or Steven Joyce when I write posts. They haunt me! We can easily get forced into a false dichotomy that “two legs bad, four legs good” and motorways and PT fight each other. I wonder what transportation would look like in the long term if the government just gave every citizen their piece of the transport budget to spend as they saw fit instead of government deciding and instead let the private sector compete without subsidy. What would the mode share be?